A puppy's first pet grooming session is a most momentous occasion, similar to when a human kid gets his first haircut. Working with pups can also try the patience of the most skilled ​pet groomers.​ Your initial approach can have a lifelong effect on a pup, be it positive or negative. Here are some important tips for dealing with the little tykes, for the benefit of all involved. During the first grooming session, the main idea is to familiarize puppies with the process. As mentioned previously (and this cannot be overemphasized) a pup's initial experiences at the grooming salon can set the stage for how he responds to being groomed for the rest of his life. So it's important to make the experience as pleasant as possible. You can get a jump on navigating the challenges of introducing your puppy clients to the pet grooming process by giving their parents some tips for preparing the pups for what could be a scary experience. The more socialized and used to being handled a puppy is, the better. When new puppy parents call to make the first appointment, encourage them to prepare their pup to be handled in ways they might not be used to. For example, advise the pup parents to regularly tickle their paws (including between their toes), ears, and tushies, which are some of the areas you will be working on. On the big day, when the puppy first arrives at your shop, be sure to start by slowly introducing yourself to the little one via speaking to him in a soft, soothing voice, petting and cuddling him, and playing with him for a bit. Gain his trust and enable him to regard grooming as a fun, enjoyable experience. Above all, patience is key. Pet groomers should stick to an abbreviated session to avoid stressing the pup, enabling pup to get used to being handled by a groomer. Bear in mind that pups may be frightened when they are first exposed to such alien devices and tools as clippers, noisy dryers, and grooming tables. Chuck Simons, the inventor of the Groomer’s Helper grooming table device and co-owner with his wife Beth of the popular Pet Salon in Margate, NJ, offered this advice: "We don’t do a lot during the first sessions; we want the puppy to become acclimated to being handled. The first experience must be a good experience, with lots of love and treats. This is their special place away from home. If you push them through the experience and restrain them, then you ruin that dog for the rest of his life." Many puppy parents make the mistake of waiting until their pups are six months of age or older before taking them for grooming. But the general rule of thumb is that they should be no more than 16 weeks old, as younger pups are easier to train. They need to have had all of their shots before being groomed for the first time. Starting slowly will enable a groomer to build up to a full cut and other more elaborate services. "We don't fully cut their nails, we just tip them," Simons said. The same goes for bathing. "A bather has to be with the puppy at all times; it has to be a loving experience. It’s just like with a baby; you help them through it so that bath time becomes a fun time. Just lavish them with love. It’s through that regularity that they come to terms with the grooming experience." 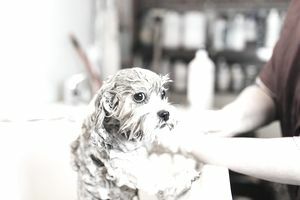 Simons added that it takes two to three sessions for a pup to become totally acclimated to and comfortable with the grooming process. But if approached the right way, this can enable a pet groomer to establish a lifelong happy relationship with their new pooch clients, which will ensure their long-term health and happiness. "You are going to be grooming that dog four to five times a year for the rest of his life," according to Simons. "If you provide a pleasant experience, they will see the grooming salon as their loving place away from home, and will be happy to come there."